For the third year in a row, Architects & Engineers for 9/11 Truth has rallied members of the American Institute of Architects (AIA) to submit a resolution that calls upon the AIA to officially support a new investigation into the collapse of World Trade Center Building 7 (WTC 7) on September 11, 2001. The resolution, which can be found on page 34 of the Delegate Information Booklet, will be debated and voted on by hundreds of delegates at the AIA’s annual business meeting — before the start of the Orlando convention — on Wednesday, April 26. Why Support a New WTC 7 Investigation? As the largest association of architects in the world — with some 90,000 members — the AIA is a respected voice on matters concerning the built environment and on larger issues such as social equity and human rights. The AIA routinely weighs in on the challenges facing our society, and the message it sends matters a great deal to our political leaders and to millions of Americans. 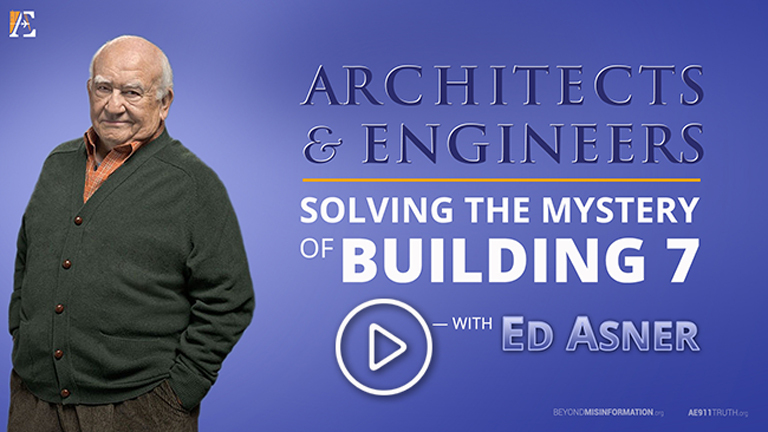 When it comes to understanding what happened on September 11, 2001 — a day that reshaped our world — architects are uniquely qualified to contribute to the ongoing debate. At 5:20 PM, the 47-story WTC 7 fell completely and symmetrically into its own footprint in the manner of a textbook controlled demolition. Seven years later, the National Institute of Standards and Technology (NIST) concluded that the collapse was due to normal office fires (which had never before brought down a steel-frame high-rise). But today thousands of architects and engineers are calling for a new investigation. For more on why the AIA should support a new investigation, we invite you to read lead sponsor Daniel Barnum’s letter to the AIA membership. The first part of the resolution outlines how the collapse of WTC 7 exhibited all the signature features of a controlled demolition. The next part cites eyewitness accounts of explosions immediately prior to and during the collapse as well as the professional opinions of structural engineers and demolition experts. The following part of the resolution highlights foreknowledge of the collapse — that is, officials at the scene had an exceedingly high degree of certainty that WTC 7 would eventually collapse, which they could not have had without having been told that the building was going to be brought down intentionally. The final part of the resolution illustrates the shortcomings of the investigation conducted by NIST. The first resolution, submitted at the 2015 convention in Atlanta, garnered 4% of the vote. At the 2016 convention in Philadelphia, that number nearly tripled to 11% — an increase that surely reflected a growing awareness of the need for a new investigation among the AIA’s membership. Over the past 12 months, we have worked vigorously to inform thousands more architects, attending several state and regional AIA conventions and sending brochures to 25,000 members of the AIA. On April 26th we’ll find out where AIA members now stand on this important issue facing our esteemed association. If you’ll be voting at the annual business meeting and you’re learning about WTC 7 for the first time, we encourage you to watch our 15-minute Solving the Mystery of WTC 7, in addition to reading the resolution carefully. Whether you’re an AIA member or not — or whether you’re coming to the convention or not — you can play a part in getting the WTC 7 resolution passed! Become a Voting Delegate! Some local chapters such as AIA Los Angeles and AIA Chicago welcome any interested members who plan on attending the convention to be their chapters’ voting delegates (other chapters reserve that role for their president or board members). If you’re attending the convention, please contact your chapter right away and ask if you can be a delegate. Speak at the Annual Business Meeting! We enthusiastically encourage you speak at the business meeting, where the resolution will be voted on. Any member who wishes to speak is given two minutes. It’s critical that your voice be heard. Email us if you’re interested in speaking at the business meeting — or if you just want to connect with us at the convention. Urge Your Representatives to Vote Yes! Call or email the board members of your local chapter — or even attend their next board meeting — and ask them to vote in favor of the resolution. We recommend sharing with them our WTC 7 Resolution brochure as well as our 15-minute Solving the Mystery of WTC 7. Share Our Materials! 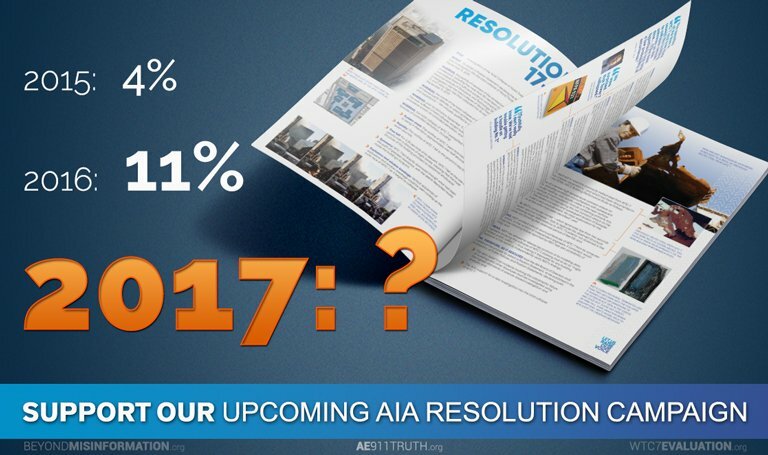 Send our WTC 7 Resolution brochure to any AIA members or other architects, along with a link to Solving the Mystery of WTC 7. Donate to Our WTC 7 Resolution Campaign! 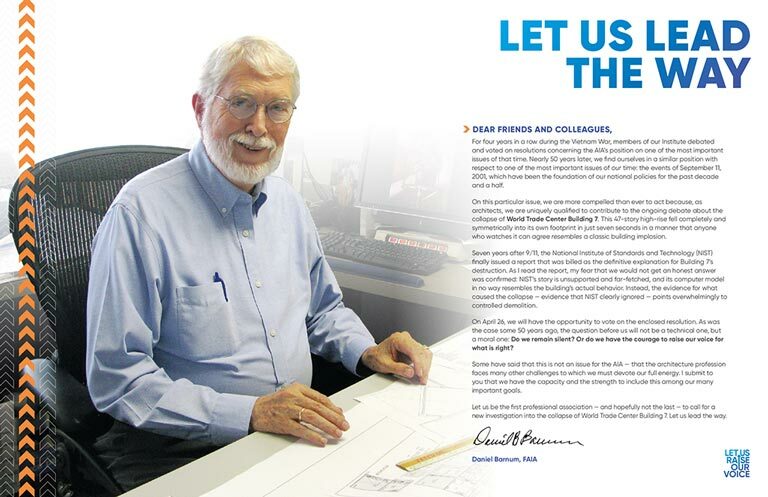 Help us raise the $10,000 we need to mail our printed WTC Resolution brochure to 2,500 AIA chapter leaders and send our staff and volunteers to the national convention in Orlando. As of April 6th we’ve raised two-thirds of that goal! Make a donation of $20 or more and we’ll send you your own printed copy of the mailer as a token of our thanks. Donate Now!